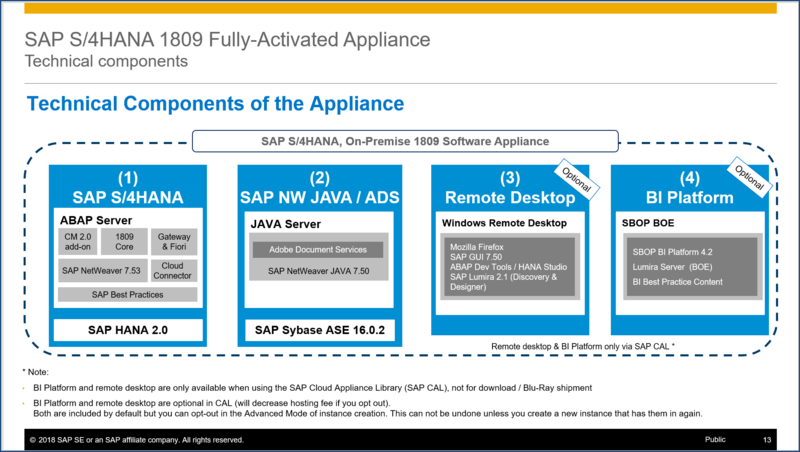 The appliance is a pre-packaged software bundle that contains an SAP S/4HANA system with pre-configured SAP Best Practices and demo scenarios. It can be rapidly brought up as your personal instance with administrative rights either hosted in the cloud (takes ~ 2 hours) or on your own on-premise hardware (takes ~ 2 days). Typical use cases are sandboxing, proof-of-concept, scoping, or fit-gap analysis. Once you have such an account, the easiest way to start is the SAP S/4HANA trial (SAP licenses are waived for 30 days; only the cloud provider hosting fees apply). An extensive demo guide walks you through sample scenarios with pre-defined users and data sets. If you are already experienced with the underlying infrastructure (SAP Cloud Appliance Library, SAP CAL), you can jump directly to the solution. The SAP S/4HANA 1809 FPS01 Fully-Activated Appliance is available (not in all regions yet, this is in the works). What is an appliance ? This makes it an ideal medium for pre-configured systems e.g. for sandboxing, proof-of-concept or scoping/fit-gap purposes. In the SAP S/4HANA fully-activated appliances, you will find the SAP S/4HANA software (along with some other components, see further below), the fully-activated SAP Best Practices for SAP S/4HANA (incl. technical configuration e.g. for the Fiori launchpad), and prepared demo scenarios with sample master and transactional data. 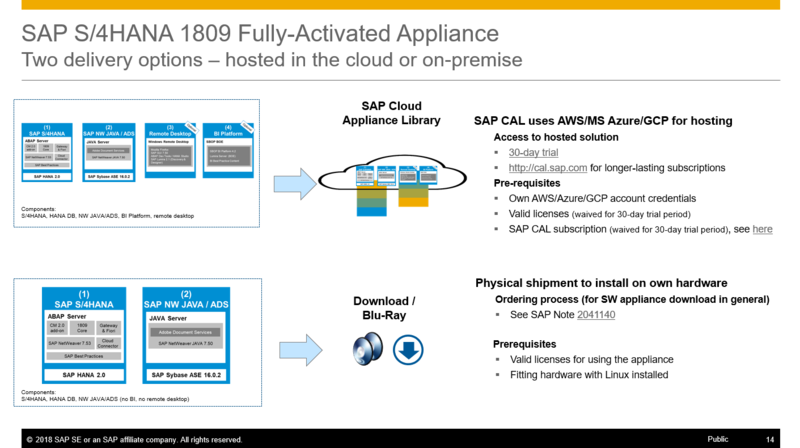 The delivery infrastructure for appliances is the SAP Cloud Appliance Library (SAP CAL, https://cal.sap.com), and if you browse this site you will see many more appliances besides the SAP S/4HANA Fully-Activated appliances. In a hosted environment (using cloud provider infrastructure such as Amazon Web Services (AWS), Microsoft Azure, or Google Cloud Platform (GCP) with the SAP Cloud Appliance Library (SAP CAL) as bridge into the hosting providers. Setup time is ~ 2 hours, and the easiest way is to use the SAP S/4HANA 30-day trial. On dedicated on-premise hardware that has a supported Linux release installed (everything else will come with the appliance). Pure setup time is ~ 2-3 days. This delivery option is available for a limited set of appliances only. The default shipment channel is SAP CAL. Hosting provider fees are charged to your hosting provider account (~ 3-4 $ USD per uptime hour, depending on provider and data center region). If you are new to SAP Cloud Appliance Library, there’s a detailed ‘Quick Start Guide’ on the SAP S/4HANA trial page to get started. Registration in SAP CAL and one of the supported hosting providers (AWS, MS Azure, (GCP) takes ~15 minutes, start-up of your personal trial instance will take ~2 hours. This video playlist for SAP CAL will also help to get into the topic. You can receive the appliance for installation on your own on-premise hardware either via download or via shipment on Blu-Ray discs. The shipment is free of charge, however, corresponding SAP licenses need to be in place (trial licenses are sufficient for delivery). The installation of an appliance differs from a “regular” SAP installation, we therefore recommend to have this done by SAP Consulting or an experienced SAP partner, however, customers can also do it on their own and will receive support from SAP. Ordering of the discs/download by a partner and deploying it on customer-site afterwards is not allowed. The following SAP note contain more information on the ordering process (it is valid for customers and partners). What is the content & scope ? The scope of the appliance centers around the SAP Best Practices content for SAP S/4HANA and is enhanced by further scenarios. The below walkthrough scenarios have been described in detail in an extensive demo script, but of course, you’re free to explore and adapt the system as needed since you have full administrative rights and even access to the Linux operating system. What is technically contained in the appliance ? 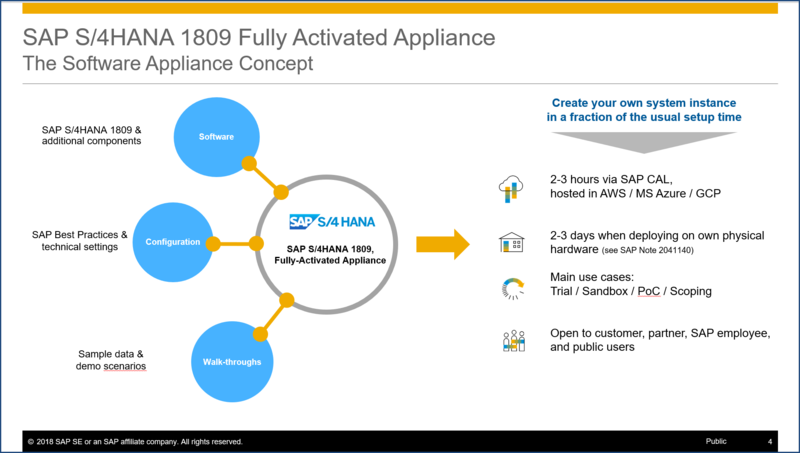 Technically,the 1809 fully-activated appliance has been created by doing an upgrade – both for coding and content – from its predecessor release, the SAP S/4HANA 1709 FPS01 Fully-Activated Appliance. The BI platform and the remote desktop are optional components in SAP CAL (you can opt out of the deployment in the advanced mode of the SAP CAL instance creation) and are also not shipped to customers for the on-premise installation. This blog summarizes the known issues and provides fixing hints where available. It will be continuously updated. Once you have created an appliance instance (be it hosted or on-premise), it behaves like a regular on-premise system. And this means that SAP cannot access or patch your appliance instance, thus system tasks need to be done by the person who created the instance. Thanks for the detailed blog on this , I have a question on the content/demo data is it equvivalent to the standard IDES shipments which we get from SAP service market place ? The content is different from the IDES. The scope of the content is centers around the SAP Best Practices for SAP S/4HANA and is enhanced by further scenarios from other product groups. I have a question about IDES / Fully-Activated Appliance. So, for S/4HANA 1809 On-Premise version, there is No IDES provided, right? The Fully-Activated Appliance is the only pre-configured On-Premise system the consultants can try and study, if they do not want to choose CAL. For now, the answer is yes. You can get CDs for installation option too if you don’t want CAL. see this for detail. We have successfully setup the S41809 Appliance system as per the instruction. Do you about availability in AWS GovCloud West ? we don’t offer AWS GovCloud. Is “regular” AWS an option for you ? Or alternatively, you could install the appliance on your own premises hardware (it’s a bit more effort than in the cloud, though). Thanks a lot for the excellent blog! Does S/4 Hana trial comprise the IBP add-on software components? If yes, are we allowed/access to configure DP agent to connect with IBP. We don’t have IBP add-on on the trial system, but PPDS & GATP of APO are included in the this S/4HANA trial system. HANA has the capability of crunching complex algorithms as APO does using live cache and probably that is the rationale for providing APO features like PPDS (Production planning & detailed scheduling) and GATP (Global ATP) as a part of simple logistics running on HANA. Multi-level explosion (MATP) , Location & material substitution, advanced BOP are some of the key features of GATP. The blog is really useful. Thanks a lot. I am a MDG application / functional Consultant. I have few questions. Who does the Model Company content download to a S4 HANA system on HEC ? Is it the BASIS team or HEC Team ? If the existing S4 HANA on HEC is of version 1809 and a new model company content is available for 1809 FPS01, can the new model company content be downloaded ? Can we keep adding / downloading new CAL contents to an already available S4 HANA instance on HEC ? please check SAP-internally with the HEC team in your region. There are ways to both deploy Model Companies (to speed up the actual implementation) as well as the fully-activated appliance (for sandboxing, scoping, PoC, …). Thanks for the blog, very usefull and clear explanation. 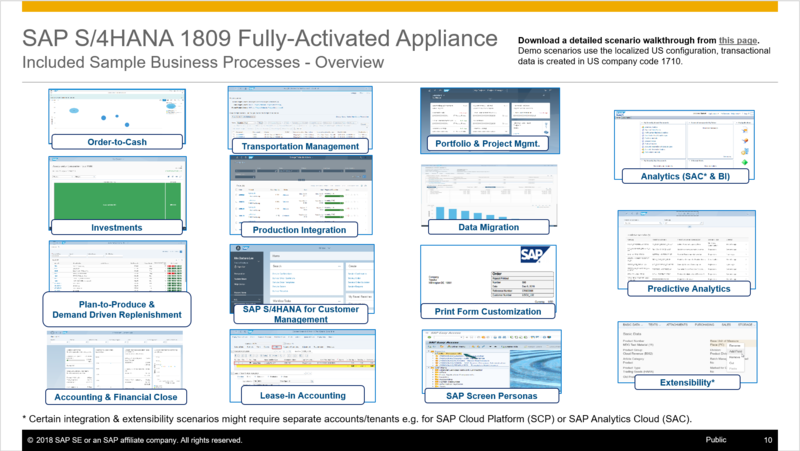 Is the “SAP S/4HANA 1809, Fully-Activated Appliance” available in Spanish? Or only English is supported? Some customers in Latin America are not confortable working in English, and we might have a restriction to use CAL as a quick start up of the Explore Phase. the Spanish language pack is installed i.e. you will see Fiori & SAP GUI in Spanish. The pre-configured demo scenarios (with sample transactional data in client 100) follow the US localization, but for most cases this won’t be a huge derivation from other countries. If you need more information, please contact me SAP-internally. Hello, thanks for sharing this information. We have some customer enhancements that are critical to some of the processes to present to our customers. Can we implement those enhancements in this appliance? Its basically some ABAP enhancements. you have full administrative access to all areas of the appliance (it’s your own system), so that should be possible. You might need to install a maintenance certificate, a developer key, … but this depends on what exactly you want to do and on your contract status with SAP (partner / customer, contract type…).